As construction boomed nationally in the postwar era, New York City made large-scale investments in its public service infrastructure. 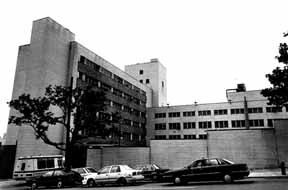 In 1957, due to overcrowding, and a detention capacity of only 105 beds at East 12th Street, Youth House moved to more spacious facilities. 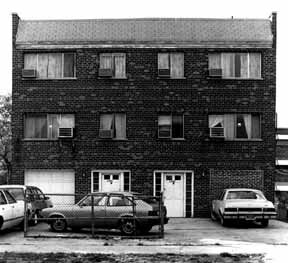 Its new location, in the Hunts Point section of the Bronx , was comprised of two separate buildings; one for boys and one for girls. The boy's detention house, build atop a hill at 1221 Spofford Avenue had an initial capacity of 239 beds. The girls' institution, at 765 Manida Street, accommodated 125 girls. Over time, the boys' facility became known as Spofford Youth House, and then Spofford Juvenile Center. The girls' facility was known as Manida Juvenile Center. The facilities were at first operated by Youth House Board Incorporated, a non-profit group. This would be the first of several organizations to operate Spofford. Throughout its first 20 years of operation, Spofford was the focus of criticism and controversy. For a variety of reasons, ranging from administrative failures and staff abuses, to the physical limitations of the building, it became known as a place that exacerbated the problems of juvenile delinquents. Spofford was also known for its frequent escapes. Between 1976 and 1978, there were 202 escapes. In 1967, the City turned control of Spofford over to the Department of Probation, and then in 1971, to the Human Resources Administration. The Beach Avenue Group home, a Non-Secure Detention facility. Non-Secure Detention was created that same year as a group home environment for children with less serious violations. At the same time, the Stone Report recommended the creation of the Department of Juvenile Justice. The Agency, formed in 1979, was charged with coordinating detention for the City's youth, with the hope that clear and singular responsibility would prevent the reoccurrence of past problems.